Posted on November 18, 2015 by Appropos / This entry was posted in Informative. Bookmark the permalink. With the exponential expansion of glass water pipes, we’ve seen new designs incorporated as the pipe producers steadily innovate to reach a wider audience. 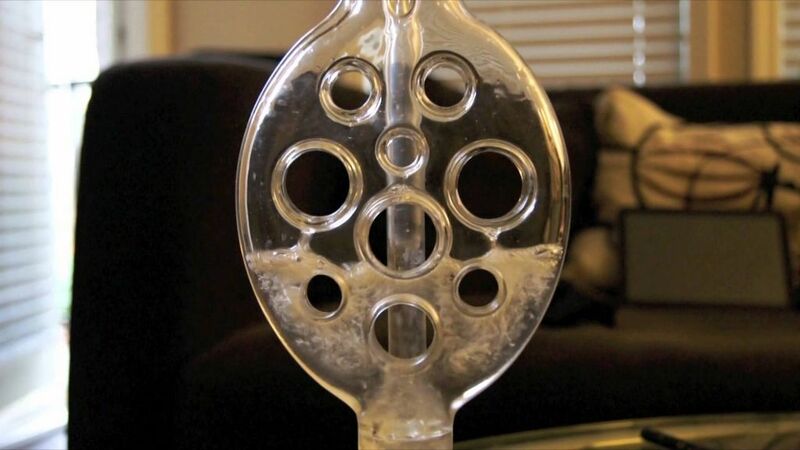 For example, the majority of glass water pipes now include ice catchers blown into the stem of the piece. These are quite basic yet add a significantly beneficial feature to a water pipe that transforms it into a much more effective piece by allowing you to place ice cubes inside your device to help even further cool the smoke. But it doesn’t stop there! It’s apparent that a sole ice notch feature isn’t enough for many smooth smoke seekers. 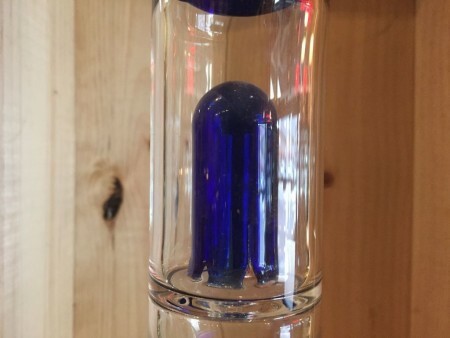 There have been a growing number of percolating water pipes making their way into the marketplace. These further assist in filtering and cooling the smoke by adding extra compartments for the smoke to diffuse before entering your lungs. It has become clear that finding the best way to enjoy herbs and tobacco is an ongoing process and people are always looking to intuitive new water pipe designs to achieve the smoothest, coolest, most enjoyable smoking experience possible. Diffusion provides more than merely a visually pleasing bubble effect in your pipe – it creates a smoother hit for the user. This is caused in part by the cooling effect that water has on smoke or vapor. The more water the smoke makes contact with, the more it cools down; a cooler hit means a smoother hit. That’s why dry pipes can be somewhat harsh – the smoke isn’t cooled off very much before it gets to the user’s lungs. This cooling effect is also why many smokers like to fill their water pipes with ice before use. A water pipe percolator is a small additional sub chamber within the shaft of a water pipe that provides “smoke-water interaction via heat exchange and dissolution“. The primary function of the diffuser is cooling the smoke and combustion vapors that pass through it. An exchange of heat between hot smoke and cool water is caused by the surface of bubbles coming into direct contact with the water. The surface of the bubbles come into direct contact with the water, where the temperature difference causes an exchange of heat between the hot smoke/vapor, and the cool water. In addition to cooling the smoke, diffusion actually helps to filter it as well. When you burn any organic material, including plant material, there will be some amount of undesirable toxins that are released. These toxins not only make for a harsher, cough-inducing smoke, but can also negatively impact health. For this reason it would be ideal to filter out as much of the undesirable by-products as possible. Percolators do just this! Below we’ll be discussing a few of the many styles of percolating waterpipes. The simplest form of percolator, the straight tube is simply a downstem with slits at the base that go under the water which lets smoke pass through the water, cooling it down. Another popular kind of percolator is the “Tree Percolator”. These are made up of one or multiple individual flow paths that allows the smoke to enter the water. Current styles include twist trees and bent arm. The size of each slit and the number of slits combined should equal the inside diameter of the up stem for equivalent air flow. There can be anywhere from 4 to 64 arms within one of these tree style percolators, and the more arms, the more diffusion. Arms will either be open bottomed or closed, usually with slits on the sides. 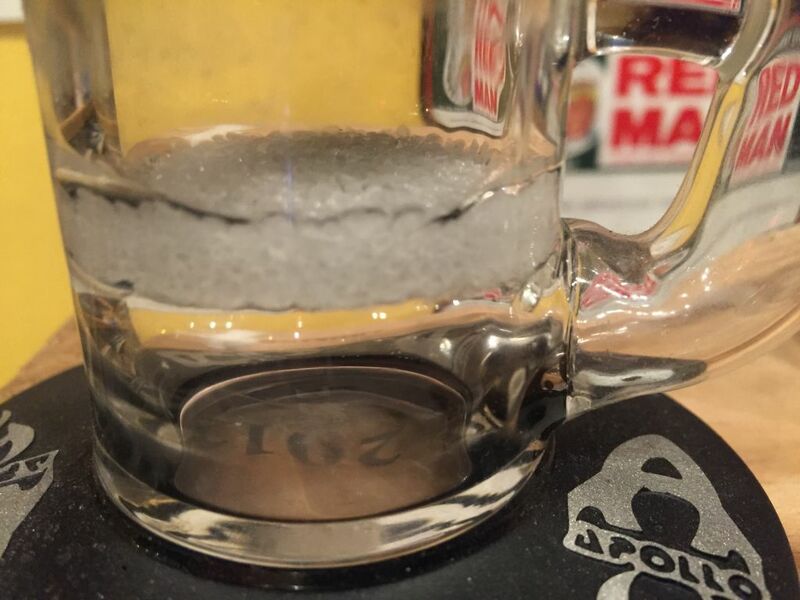 Smaller slits give smaller bubbles, which provide more diffusion. The more arms the more the smoke is separated, which allows for even more filtration and percolation. Our Green Percolator Water Pipe is a top seller! 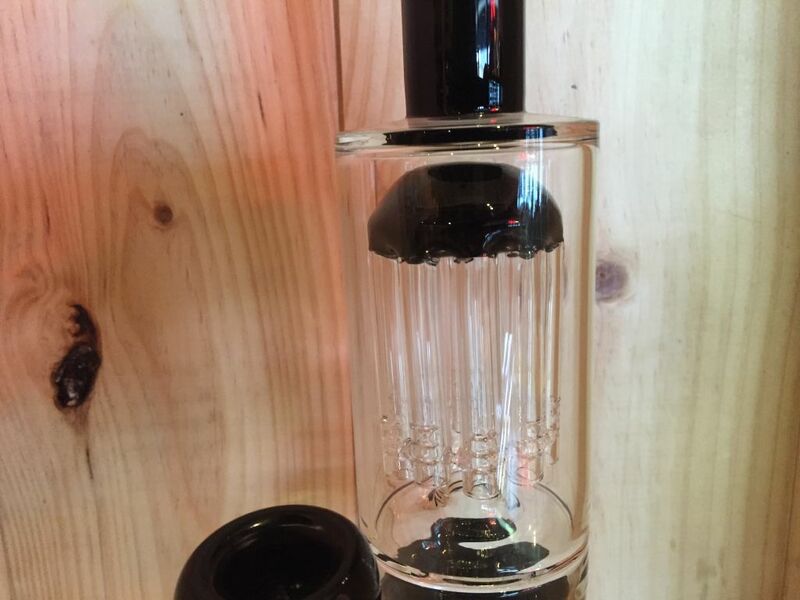 Dome percolators have one circular cylinder shaped piece that directs the smoke to the bottom of the water filled based. Some have a small amount of holes that are large or a great deal of holes that are small. The inside diameter of the up the stem determines the number of holes and the size of the holes or slits. These percolators allow for diffusion when the smoke passes through the dome and separates when exiting the holes on the edges. 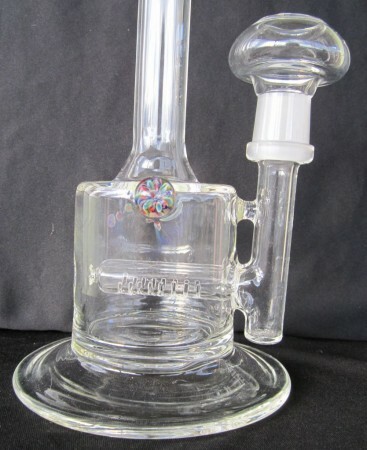 Check out our Jumbo Double Dome Percolator Glass Water Pipe. A “Frit” diffuser or fritted disk is made up of fragmented glass that has tiny spaces between them. The large amount of small holes create spaces that allow for maximum diffusion. These types of percolators require more frequent cleaning but can be accompanied with an ash catcher to avoid this issue. Check out the Fritted Apollo Glass Water Pipe. 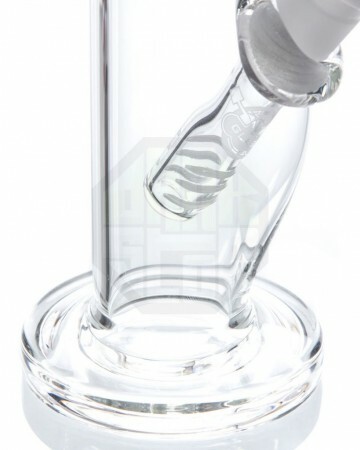 A gridded inline perc is a horizontal tube with gridded slits cut around and under the tube. These are often referred to as barrel percs. A type of disk perc, that looks like a honeycomb. They provide more diffusion than a standard disk perc because of the number of small holes that further divide the smoke that passes through them. The more holes the better the diffusion, but if the holes are too small, drag increases. Honeycomb diffusers rest above the water parallel to the surface. They do not easily break because of where they lie within the pipe. They are one of our favorites types of percolators carried at our head shop, as they are quite efficient. They can have as many as 100 holes for a single percolator. Bubbles are created in the water as air is drawn down in the piece, forcing the bubbles to make contact with the honeycomb and pass through its many holes. This increases surface area and reduces the size of the bubbles, allowing for filtration of carcinogens and cool, smooth hits! Check out our Honeycomb Rover Glass Water Pipe. A vertical tube that flairs out at the bottom, with slits or holes for diffusion. 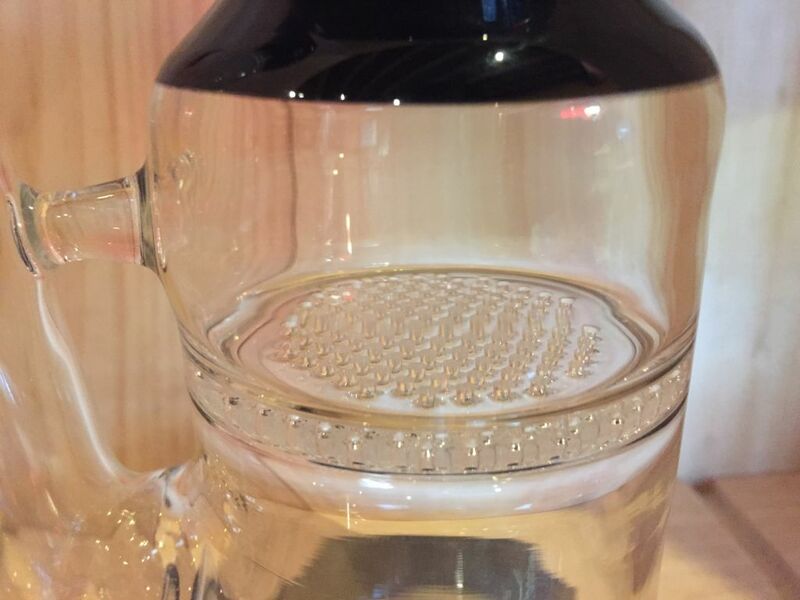 A vertical style percolator seen on an unique style of water pipes that resembles swiss cheese. The holes are made on a large vertical disc like shape lets smoke pass around them. It’s amazing to see the innovation in the pipe industry. 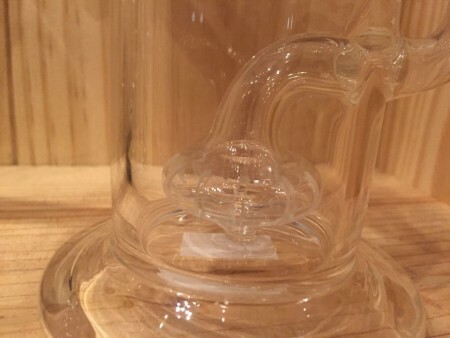 The way that these designers are combining functional efficiency with aesthetic beauty really pushes the glass pipe industry into a unique area, making sure that it doesn’t fall away to the newcoming vaporizers. People love smoking out of glass, and the search for the best possible hit provides an ever expanding landscape for collectors, designers, and the paraphernalia wielder to traipse through. The wide variety of possibilities turns our store into a garden patch of near botanical beauty, giving the herb and its exploration of strains the perfect counterpart to combust within and make one with us, those seekers of the ever better hit.